Yarn: Peruvian Highland Wool from Elann in Oxblood, Coffee Bean, and Aubergine. I love this sweater and this yarn, plus it was a kick to knit. It took just long enough to really FEEL like big project, but was really only a little challenging for a fairly new knitter. All-in-all, perfect for a FIRST FREAKING SWEATER EVER! What? Lent is over. I can say it all I want. Oh, and please ignore the wine-stained lips and the drunk-eyes. Unless, of course, you think that sort of thing is attractive...uh, but don't tell me about it if you do, mmmkay? And stay away from my cocktails. I had decided not to post ANYTHING else here until I actually had some finished stuff to talk about. And now I do! But first -- there's even more of this stuff this weekend (booooooo). I have to admit that while we've had a very nice, extry-snowy winter here, I'm pretty much done with this stuff. It can be spring now. Really. Flowers and birds and stuff. I like that. However, I guess it should be a little bit chilly for just a little while because Under the Hoodie is DONE and ready for wearing! And not a moment too soon, either, as even I was getting tired of my absolute obsession over finishing this sweater. Sometime earlier this week I finished the hood, then Friday night I sat down to attach the sleeves and seam up the sides. As you can see, I had some help. Don't you pay Leon any mind, he's not REALLY sleeping, he's trying to lull me into a false sense of safety. See, he's betting that I'll chase Josie off when it comes time to pull out the shiny needle and captivating flying yarn because, well, look at her -- you just KNOW she's not going to be able to resist "helping" with that too. But not him, nuh uh - no WAY. He's sound asleep, yup, you betcha -- no threats to life, limb, and yarn here. Totally innocent, that's him. Yeah, I didn't fall for it either. 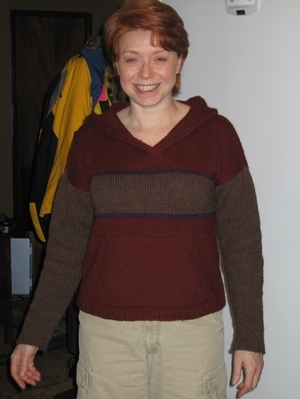 Taken the next day, of course, because by the time I had finished seaming this, my very first sweater, even the cats had abandoned me because it was WAY past even their bed time. Seriously, I think it was something far closer to 3am than I want to contemplate. 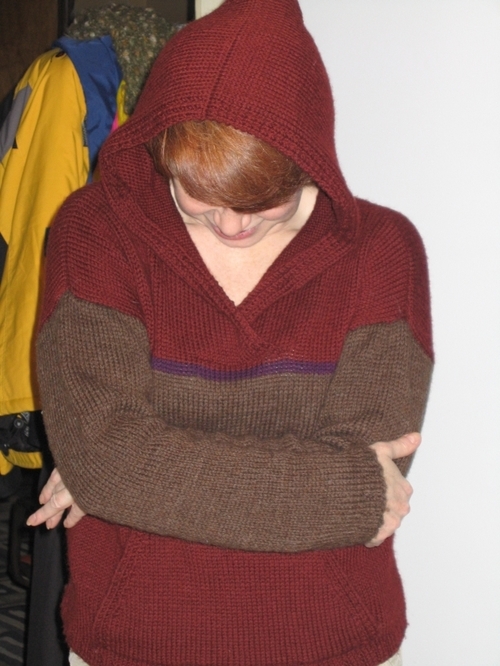 I'm pretty happy with the seaming, and the sweater is beautiful and warm and scrumptious. Well, OK, not in this picture since this is pre-washing and pre-blocking, but it is I swear, and I'll show you very soon. But not today. Why? Well, because the camera battery died while taking these photos and I can't for the life of me find the charger. So there. I whispered it so that not everyone would hear what an idiot I am, but that's why. I wore it to our L-Word gathering Sunday night and to work yesterday and got lots of ooohs and ahhhs. That was really fun, especially since I'm unlikely to ever make such a big deal out of such a simple sweater again. I'll post an action shot or two and the details soon. In other knitting news, I also finished Rick's Irish Hiking scarf. Well, I had finished the knitting part a while back (like, Valentine's Day *gasp*), but had never woven in all the endy bits. I think maybe I mentioned I was obsessed with the hoodie, right? Yes it's true, I'm a terrible wife to allow my husband to go scarfless in Boston in the dead of winter so that I can finish a sweater for ME. A show of hands for who's surprised? Right, I didn't think so. But now it's done, washed and blocked, and it's very soft and yummy and makes me want one just like it. Nope. No pictures of it yet either. There was a little bit of fun, super-secret knitting for some birthday goodies as well and as soon as those are received, I'll post their pics. And now I'm off to a place where they pay me to do stuff that I like far less than knitting. Boo. 1 1/2 in. to go on the hood of the hoodie!!! The sleeves are done and the shoulders seamed, so once this last tiny bit of knitting is done, all I have to do is attach those sleeves, seam up the sides and give it a quick wash. That's VERY exciting. I thought I might actually have a hood to show off today, but no such luck. Instead of knitting I slept. Not on purpose, mind you. It was one of those sit-down-for-two-seconds-and-wake-up-two-hours-later-when-the-phone-rings naps. Apparently I was tired. It's a good thing the phone rang, though. When I woke up, Leon was staring disconcertingly at my fingers dangling off the arm of the chair. I can't decide if he was contemplating trying to wake me or trying to eat me, but since it was about two hours past their dinner time that could have gone either way. I'm only half kidding, he's SERIOUS about dinner. Well, all food really, but especially the miniscule serving of canned food they get each evening. I've tried convincing him that really, it's just a little treat at the end of a terrifically hard day of sleeping guarding the house, but he's unmoved by my logic. If he could speak something other than Siamese, I suspect I might learn some new obscenities whenever dinner is late. But I digress. We've dinner plans this evening, but hopefully I will still have time to finish the hood, and maybe even get some seaming done. Stay tuned for tommorow folks when I regale you all with the excitement of hand-washing a bathtub full of woolens. Can you stand it? I heart snuggling. So does Leon. What you can't quite tell from this picture is that he is under the covers with Rick. He insists on it. Cutest.cat.ever. What else is a holiday weekend good for? Being sick. How's that for a kick in the pants? The only up-side to that is the knitting time. 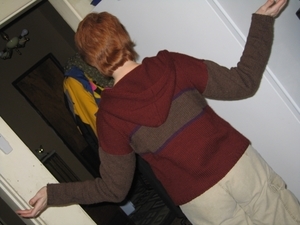 I finished Rick's sock and the back of the hoodie. Then I cast on for the 2nd Pippi kneesock. The sock turned out to be too much work for my hands, who were aparently suddenly on tiny-needle-strike, so I cast on for the front of the hoodie. Turns out that I can also knit that with my eyes closed. Not SO different from knitting it in a dark car, I guess.